British designer Dominic Wilcox is no stranger to seeing new uses for everyday things - in the past he's unveiled wooden-handled paintbrushes upcycled into hooks and a wall shelf made out of dollar-store color pencils. In his solo show Variations on Normal at London's KK Outlet, he showcased his latest vision: a GPS shoe "that will guide you home no matter where you are in the world." With Wilcox’s No Place Like Home shoes, the magic doesn’t come from clicking your heels twice but from GPS. Program your destination, and the leather footwear will tell you where to go. There’s a GPS receiver in the heel of the left shoe, and a circle of perforations reveal LEDs that light up to indicate the direction to travel. 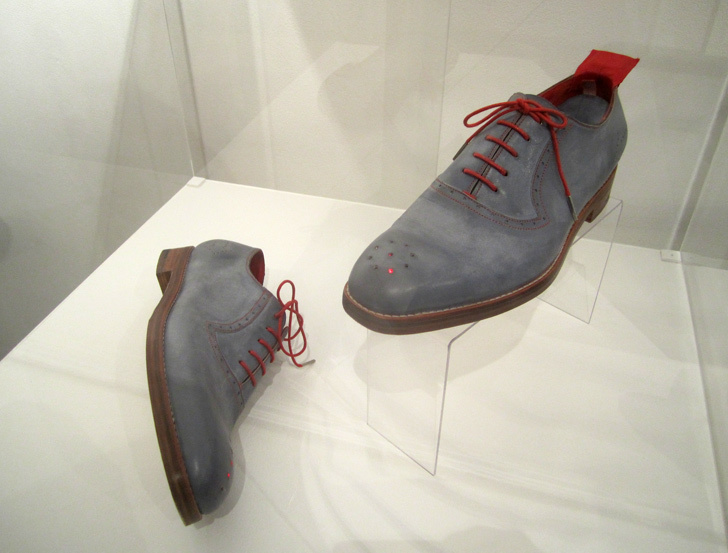 The right shoe indicates distance travelled, with a row of red LED lights that illuminate as the wearer gets closer to home. The leather soles are decorated with doodles of buildings and places in Wilcox’s signature style. Made in collaboration with traditional English shoe maker Stamp Shoes and interactive art technologist Becky Stewart, the GPS shoes were commissioned as part of the Global Footprint project in Northamptonshire, in the East Midlands of England. The Global Footprint project invites artists and designers to explore the economic, cultural, social and environmental impact of the shoe and boots industry that once defined the county. Wilcox’s take on sustainable design is in the repurposing and reinterpretation of everyday, often overlooked objects and materials. “I’ve convinced myself that inside every single thing in the world there are hundreds of surprising ideas, connections and possibilities waiting to be found,” he says in the show’s opening description. Some of his greatest hits, like his fruit bowls made from plastic army men, are on show, interspersed with curious objects from his personal collection, and drawings from his popular, Webby Award-nominated blog variationsonnormal.com. The humorous but insightful drawings, which had people laughing out loud at the opening, are collected in a new book also called Variations on Normal. His curated selection of extraordinary ordinary items include a Soviet mechanical calculator, a light bulb testing device, and plenty of interesting but not entirely identifiable artifacts. “I kind of like not knowing their functions,” he says. And why not? As Wilcox shows, there’s no need to limit the potential of the everyday object. Variations on Normal at KK Outlet runs from September 7-26, 2012 as part of the London Design Festival. 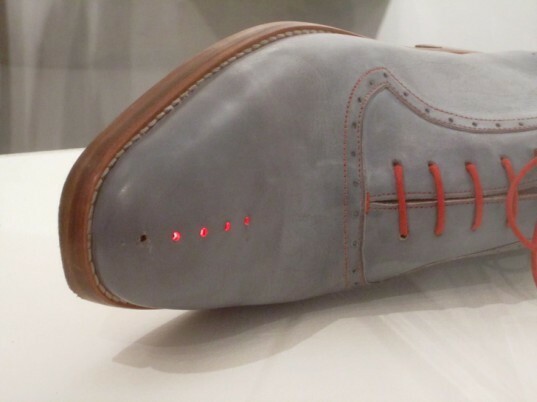 The wearer's left shoe has a circle of LEDs that light up to indicate direction, while the right shoe has a row of LEDs to signal distance. 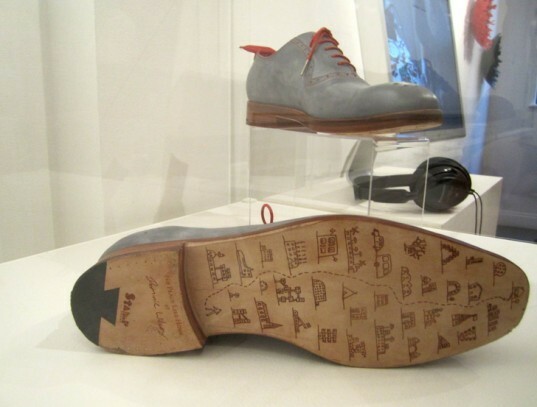 The leather soles are decorated with doodles of a person making his way home, and bear the signatures of designer Dominic Wilcox and English shoe maker Stamp Shoes. There's a GPS receiver embedded in the heel, and red LED lights indicate direction and distance. A limited edition version of Dominic Wilcox's classic War Bowl re-enacts the Battle of Waterloo, formed of melted red plastic British Artillery and French Infantry figures. The Variations on Normal exhibition shows Dominic Wilcox's designs interspersed with his Invention Drawings and collection of oddly appealing everyday objects, like a set of saw blade samples. Among the objects in Dominic Wilcox's personal Oddity Collections is a German map distance measuring curvimeter, designed to be worn on the wrist. Designer and artist Dominic Wilcox demonstrates how an antiquated light bulb testing device, one of the items in his Oddity Collection, might have worked. An Invention Drawing proposing a personal energy-saving suction adaptor for a drinking straw, perfect for those who are both thirsty and lazy. One of Dominic Wilcox's visions for a better world: a high rise building disguised as a grassy hill.